Blackberry’s Playbook tablet is launching in the Philippines on August 6, 2011. This is based on the press release of Research in Motion, maker of the PlayBook. The BlackBerry PlayBook will come in three Wi-Fi models, featuring 16 GB, 32 GB or 64 GB of memory storage, and will be available nation-wide from authorized retail stores and mobile operators. Manila, thePhilippines– 21 July 2011 – Research In Motion (RIM) (NASDAQ: RIMM; TSX: RIM) today announced that the BlackBerry® PlayBook™ tablet will be available in thePhilippinesfrom 6th August 2011. The BlackBerry PlayBook will come in three Wi-Fi® models, featuring 16 GB, 32 GB or 64 GB of memory storage, and will be available nation-wide from authorized retail stores and mobile operators with a 12-month warranty. “The BlackBerry PlayBook is an incredibly powerful and feature-rich tablet that is ideal for both business and personal use,” said Gregory Wade, Regional Managing Director at Research In Motion. “You really need to hold the BlackBerry PlayBook in your hand to fully appreciate how much it stands out in terms of power and portability, and so we encourage customers to visit a retail store and try it out for themselves,” added Wade. 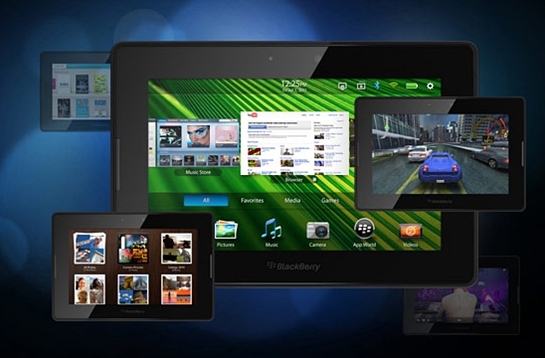 The BlackBerry PlayBook features an ultra-portable design and delivers industry leading performance, uncompromised web browsing with support for Adobe® Flash®, true multitasking, HD multimedia, advanced security features, out-of-the-box enterprise support and a robust development environment. Pricing is as follows: 16GB at Php23,990, 32GB at Php28,990, 64GB at Php33,990. Absolutely love this device. I agree the 7″ display makes web browsing a bit difficult, but I did find myself taking it more places than I did my original iPad.